» home » enterprise zones » » mired in inspection documentation? How does a sharper ERP sword slice through the job-shop grind that can keep companies mired in paperwork and sweating numerous details, rather than jumping on new orders quickly, and moving them in and out of the shop ASAP? At medical-part manufacturer Unity Precision Manufacturing, Dayton, MN, one particularly impactful ERP-software program is one that manages contract review. The software, an add-on called Synergy to Unity’s JobBoss ERP system, moves new jobs simultaneously through the company’s engineering, production and quality departments. Intially implementing Synergy in 2009 and fully utilizing it in 2015 (along with KnowledgeSync) has allowed Unity to slice more than a week from its lead time on many jobs. Using JobBoss 12.0 on the shop floor, a Unity Precision employee accesses the Workstation Driver module to manage functions such as time and attendance, and to enter time against a job. Synergy, explains Van Essen, integrates with the JobBoss standalone software package to provide full CRM functionality. It helps Unity’s management team and sales people keep track of customers and their vast variety of custom orders. It includes several modules, such as those designed to handle customer service, sales and workflow management, and can be customized. Asked to identify trends challenging Van Essen and his management team to continue performing at a high level, he notes that medical customers (medical products represent as much as 90 percent of the company’s business) keep raising the stakes when it comes to inspection reports and certifications, and for other types of documentation. Hence the increased emphasis on automating the company’s documentation processes. Unity works out of a 23,000-sq.-ft. facility (all but 3400 sq. ft. is manufacturing space), with 40 employees, to perform wire-EDM, machining, finishing, welding and assembly processes. The company has done a great job automating its manufacturing operations—it operates three robotic mills, for example. And, while it’s been using JobBoss since 1989, Van Essen notes a measurable increase in the company’s ability to leverage the ERP software just in the last few years. Automation is a way of life at Unity Precision, illustrated here by one the firm’s three robot-tended CNC mills. 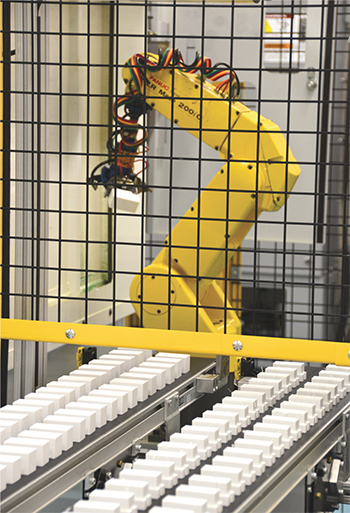 A vision system guides the robot’s pick-and-place chores, moving parts to and from the mill and a pair of conveyors. Lately, the focus has shifted to using ERP modules to drive shop-floor efficiency. 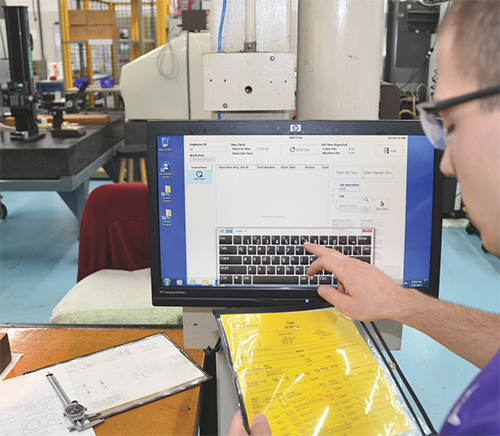 For example, Van Essen points to the shop-floor data-collection module called Workstation Driver, which sits on every computer in the shop and allows workers to quickly input the time worked on each job. They also can add job notes, attachments and drawings, and use the software to check job status by work center, part number, material location, etc. “We use the data-collection capabilities to ensure that employees are working on the right jobs at the right times. They also update job status so that our back-office personnel don’t have to, and we can use the recordkeeping capabilities to gauge employee performance and identify training opportunities,” Van Essen says. A related program integrated with JobBoss and Workstation Driver at Unity is called KnowledgeSync Event Manager. It tracks database activity and issues alerts to key stakeholders to identify areas that need attention, sooner rather than later. Unity also uses KnowledgeSync as a communication tool throughout the organization. “For example,” Van Essen says, “we can automatically send alerts out to our customers when an order ships, and provide a tracking number. This ensures that our employees and those at the customer are all on the same page, optimizing awareness about each job up and down the supply chain. It really optimizes communication between us, our customers and our suppliers. As every customer, it seems, asks for inspection reports compiled and delivered in their own, unique style, automating the creation of inspection reports has proven to be a challenge. But, Van Essen and his team are working to overcome it, using quality-management software modules from JobBoss partner uniPoint. The software manages numerous quality functions including non-conformances, corrective/preventive actions, documents, maintenance and calibration, request/change management, inspections, auditing, and education and training. When all is said and done, combining the efficiency gains from automating quality, timekeeping, inventory tracking and other functions has greatly improved productivity and, perhaps most importantly, improved customer relationships. “We have done a good job creating more detailed travelers for our jobs,” Van Essen says, “taking more time to detail out every order before they reach the shop floor. This has been a great revelation for us, allowing us to eliminate mistakes on the floor that can impact and delay scheduling. We’re also paying closer attention to entering accurate timekeeping data so that we can accurately predict ship dates, which makes our job quotes more reliable. In the end, lead times are down and on-time delivery is up, and labor content is reduced, which improves productivity.